Attractive,tough, fast, seaworthy centre cockpit cruiser, well balanced and comfortable at sea, Daq Attack has already circumnavigated and sailed most oceans. 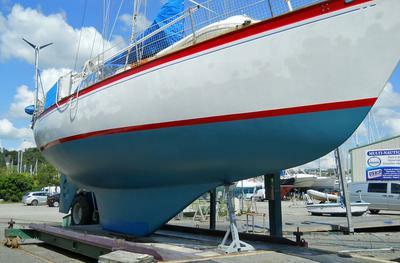 Her 3 owners have been meticulous in her upkeep and all her systems are up to date and function well. 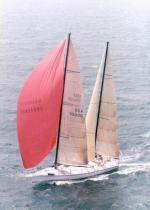 She is fully equipped for heavy weather long distance sailing in considerable comfort. With her large battery capacity and tankage, her solar and wind generation, refrigeration, autopilot and hydrovane self-steering she can be independent of the shore for long periods. Her sail wardrobe is top quality and in excellent condition. 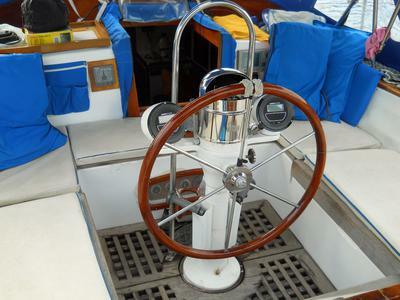 Below decks she exudes comfort and warmth with new upholstery and varnished teak. Included in the sale is a top quality RIB with a 15hp Yamaha outboard. 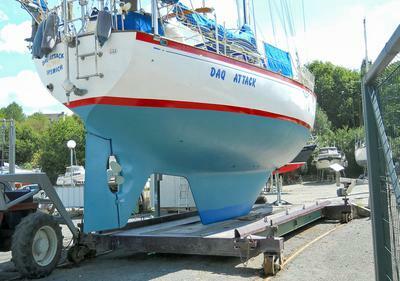 Please contact the owner, David Blackburn, at daviddaqattack@yahoo.co.uk - and don't forget to mention sailboat-cruising.com! 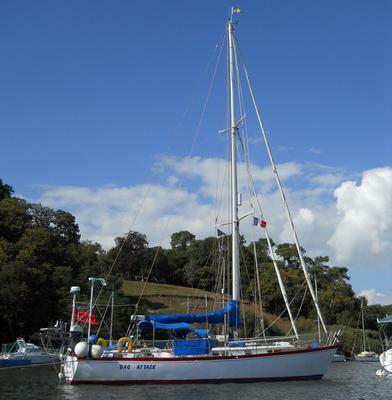 Is this fine vessel still for sale, and lying in South Brittany, France? A few years ago I sailed from Beaufort North Carolina to the Azores on this boat. My experience was enhanced by the feeling of safety and comfort afforded by the centre cockpit and heavy displacement. Also the fact that the present owners are very hands on and keep the vessel in excellent cruising condition. I just love this yacht. I have sailed on her for several thousand miles, done 2 Atlantic crossings and several trips up and down the East coast of USA, from Florida to Nova Scotia. The attraction for me is the comfort on board, especially on passage. Never once have I felt unsafe on her even during a really rough passage from Beaufort NC to Horta surfing downwind under staysail only. It's so sad that we have to sell her but we now need to downsize and accept that we are not young anymore. Daq Attack has many more years of active sailing in her. Buy her and I promise you, you will never regret it! 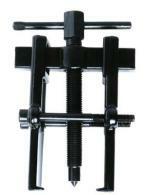 A well thought-out and highly regarded long-distance cruiser. This well-maintained and equipped example won't be on the market for long. Take a look at the Cruising World Boat Review: Peterson 44 for an independent review.